Christmas is fast approaching, and that means money is going to start flying out of your pocket at breakneck speed. It doesn't matter how much we talk about the spirit of the season being what really counts. The reality is the holidays mean paying for presents, parties and extra food. If you are already struggling under a mountain of debt, it only gets worse. It may be tempting to think you'll charge one last holiday and buckle down in January, but that is the mindset that keeps you in debt. Trust me. I may be debt-free and have an emergency fund now, but I could tell you about the Christmas we searched for a tree farm that took checks because there was no money in the bank and the credit cards were maxed out. What changed? It wasn't our income, that's for sure. It was our mindset. 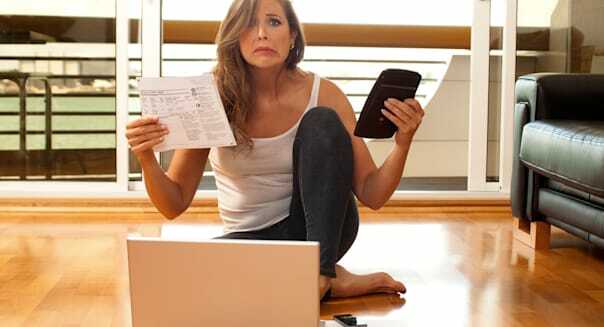 Unless you change yours, here are five reasons you'll never get out of debt. 1. You don't have a budget or track spending. Some people are number geeks and could spend all day slicing and dicing their budget numbers. You know who you are. For everyone else, budgets can be boring, restricting, dumb ... pick your favorite adjective. However, if you don't know where your money is going or even how much you make monthly, you'll never get out of debt. Every time you open your bank account, it will be a crapshoot whether there is money there. Tracking your expenses used to entail pencils, spreadsheets and agony. Now you can simply use a service like that provided by our partner, PowerWallet, to do everything for you effortlessly and free. No more excuses. 2. You shop for fun. Once spending money becomes a form of recreation, you can probably kiss your savings goodbye. Unless you have a large amount of disposable income, chances are you can't afford to spend indiscriminately. People who shop for fun spend on a whim. They see something they want, and they buy it with no thought to whether they need it or can afford it. If you pass your time wandering aimlessly at the mall or surfing retailers online, don't be surprised if your savings account balance hovers around the single digits while your credit card balance climbs to its ceiling. 3. You surround yourself with the wrong people. Likewise, you will never get ahead if you are running with a crowd that is constantly trying to "one up" one another. Keeping up with the Joneses is not good for your pocketbook. I don't want you to ditch good friends, but I do think it's smart to consider whether you need to spend time with casual acquaintances who are more interested in keeping up appearances than in keeping up your friendship. Instead, look for like-minded people who appreciate you for who you are even if you can't afford to be dining at that swanky new restaurant every week. 4. You have an 'as soon as ... ' mentality. This was one of my downfalls: I always had an excuse for why I couldn't get my money under control. As soon as the holidays are done, I'll write out a budget. As soon as I get a better-paying job, I'll start paying down debt. As soon as I finish buying the last of the Disney movies for the kids, I'll stop spending. The timing will never be perfect. Smart money management is like dieting and exercise: You will always find a reason to put it off. Waiting for the stars to align is a surefire way to remain in debt indefinitely. 5. You have a character flaw. Let's get right down to it: You may be in debt and stay in debt because you are simply too lazy, weak or self-indulgent. Remember, I've been there. I'm not judging; I'm looking in the mirror. We want to think our debt is the result of forces outside ourselves -- the hospital stay, the lousy economy, the housing market. However, at the end of the day, we need to take responsibility for our own actions. I am not talking about people living in poverty, and I am not talking about those who experienced something catastrophic, such as a total disability, that pushed them over the edge. I am talking about middle-class families who live like upper-class families even though our paychecks can't support the lifestyle. We need to acknowledge our part in our debt. Just maybe if we lived below our means and saved for a rainy day, we would be able to weather life's storms a little better. My character flaws were self-indulgence and weakness. I had a hard time saying no to myself when I could so easily justify purchases with the idea that "everyone uses credit cards." By the time I hit that fateful year in which I had no money and no tree a week before Christmas, I had dug myself a deep hole. It took me nearly 10 years to climb out. But today, I have money in the bank and don't freak out when the van makes a strange noise because I know I can pay for a repair. It's a wonderful feeling. I love living this way, and I know you will too. What do you think? Am I wrong about why people stay in debt? Feel free to tell me in our Forums. It's the place where you can speak your mind, explore topics in-depth, and post questions and get answers.